Place ingredients in bread machine in order given. Select dough cycle. Dump out on lightly floured board. Divide dough into 8 equal pieces. Form into a boulle. (fancy schmancy name for a ball) Place on greased 9×13 pan. Cover and let raise till doubled, about 40 min. Bake @ 375º for 12-15 minutes or till golden. Absolutely wonderful warm with butter. Do you eat these like rolls or are they for hamburgers? They sound delicious! 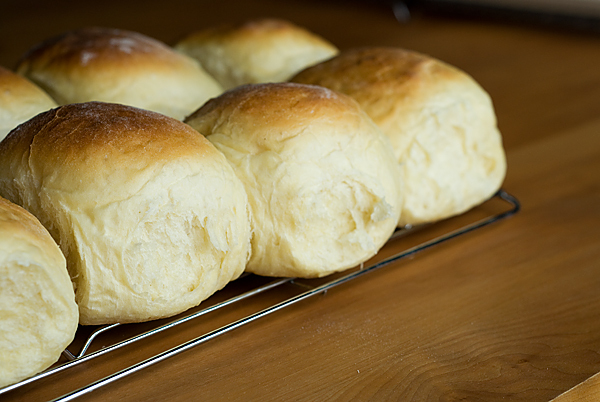 They are mostly for hamburgers or some other sandwich, but I have made them smaller and used them for dinner rolls. They are delicious! I love these! We have them often. Hi, those buns look delicious. I dont have all the ingredients to make a dough enhancer, is it really necessary? No, it isn’t necessary at all. It just helps the dough raise a bit better. What is a dough enhancer. Do you have a recipe for one? Dough enhancer is a gluten additive. There is no recipe. You could add gluten. Sometimes it is gluten with citric acid too. and…it isn’t essential for this recipe. I just made this yesterday and didn’t use any.